There are 11,500 foreigners living in Ichikawa by reason of marriage, work, study or other reasons. Though their countries and languages are different, it is our desire to help them live conveniently and safely by understanding the culture and lifestyles of the Japanese people. We accept that it is a common desire to have Japanese know something of the culture and lifestyles of their countries. Our committee has strengthened cross-fertilization between foreign residents and Japanese residents under the philosophy of multi-cultural harmonization. Attendees from all over the world cultivate relationships while visiting Japanese culture experience facilities. It is our purpose for citizens to enjoy crosss-cultural communication by attending our annual International Exchange Party. We hold a different cultural activity on an annual basis. Examples have been, cooking, concerts, sporting events and multi-cultural talks. 4) On site lectures of foreign cultures at primary and junior high schools. Upon the request of the schools, our foreign members give lectures to the pupils studying order to increase international understanding. We are supporting this education seriously since children are future international citizens. Many volunteers are participating to support teaching Japanese language for primary and junior high school children whose language ise not Japanese. Never leave foreigners with a lack-of-information. We believe it is very important to let them know the importance of daily disaster prevention awareness activities. “International Cuisines & Market” was presented at the Keiyo Gas Showroom on September 23, 2018. We introduced cuisines of three countries ? Sakusaimu (Tapioca peanut cake) from Thailand, Onion rice covered by Dahl from Pakistan, and Tacos from Mexico. They were so popular and were sold out by noon. At the facade of the building, accessories and bags from Philippines and Peru, and honey from Pakistan were also being sold. People came to shop. Sellers and shoppers talked to each other and initiated international exchange. At first, we went to a Turkey Restaurant, “Ankala” in Shibuya by subway on October 7, and enjoyed Turkish lunch. Then, we went to Tokyo Carmy in Yoyogi-Uehara. It is a majestic and a gorgeous structure. A mosque is normally located in the center of the town in order to receive God’s protection. Upon reaching the mosque, we were amazed by the beautiful open space surrounded by magnificent stained glasses. There are long lines on the floor. The visitors sit side by side along the long lines on the carpet and pray toward the direction of Mecca. This line means that we are equal before God. We were impressed by their friendship, kindness, femininity, and more. On September 1, 2018, IIA members gathered at Osu Disaster Prevention Park to encourage foreign residents as well as Japanese to understand the importance of having a disaster prevention awareness. At the citizens lounge, the person in-charge at the Disaster Prevention Section talked in-depth about the many disasters that occur in Japan and explained how to prepare for them. In the park, rescue demonstrations started with the participation of the Mayor of Ichikawa. Demonstrations include, rescue efforts from a destroyed house and transport of injured persons to first-aid facilities where emergency staff are triaging. After that, we also participated in firefighting drill, earthquake simulation, evacuation from a smoke-filled room, etc. Those who took part in this training had a valuable experience despite the hot weather of 35 degrees. It will surely be useful in the event of a disaster. On July 15th, 2018, under sweltering heat of 35 ℃., the city bus carrying 46 participants from different countries, departed from Ichikawa to its destination in Kawagoe, called Koedo. After arriving at Kita-in Buddhist Temple, which used to be the guest hall and study hall relocated from the old Edo Castle, we learned about the history of the temple and enjoyed its architecture. After this, we arrived at the place where we had lunch and enjoyed local pork, boiled radish tortoise, etc. We went out under the scorching temperature of almost 40 degrees and walked along the historic old-fashioned town that was crowded with tourists. We departed on time at 3 pm. All the people on board the bus got tired and remained quiet as the bus returned safely to Ichikawa. Pupils in 6th grade introduce Japanese culture one after another. They used the tactics to convince them easily using the ways, touching, tasting or seeing actually, and making sure after being introduced. Densuma-san, Mongolian, wore Japanese yukata “actually”, Ponmani-san, Thai, folded origami “actually” and a high school student Katsu-kun, Taiwanese, studied “hand-in-hand” with pupils. He was impressed these activities study and felt he would like to have studied at this kind of active school. The Ichkawa Kominkan on Dec. 10. It started by playing Angklung, an original Indonesian music instrument. They played about 10 songs whose sound were gentle like wind-bells. Then, Ms. Ica Sakai, working at the Indonesian Embassy, introduced Indonesia. There are 230million population, more than 15,000 islands and surprisingly more than 500 languages. The most recommended place is Pulau Lombok and most favorite vehicle is a pecha. Lastly, they served traditional Indonesian cuisines, cake made from banana, chips made from Jack fruit and Java coffee. It was the full day of Indonesian world . Forty friends of IIA went to Katori city. 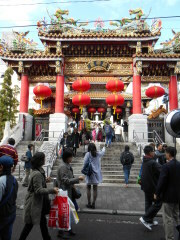 There was the Katori shrine, existed at 8 century and being surrounded by forest, beginning to turn red. After praying at the shrine, we went to the Sawara Festival which was crowded with more than 20 floats. Friends of Katori International Exchange Association kindly guided us in this town and arranged us to drag one of the floats. It was the rare chance to pull and we enjoyed very much though it was raining. We were in the bus, returning to Ichikawa, in great appreciation for friends of Katori city. Ten foreigners from Thailand, Philippines, China and USA were invited to the Nakayama primary school to receive the presentations by pupils of 6th grade on February 17th 2017. This style is in reverse since foreigners usually make the presentation to pupil about their cultures and natures. Themes were natural heritage sites in Japan, animations, Japanese music instruments, plays in old days and Japanese cuisines. They presented them very precisely like encyclopedias. After the presentations, they communicated each other very friendly to talk about their countries while having lunches. Forty people from ten countries gathered at the Ichikawa Kominkan and enjoyed international cuisines on January 29th 2017. Jose-san, the professional Spanish chef, cooked Spanish omelet. Hon-san from Myanmar made good flavor coconuts noodle. The Japanese chef taught us how to make Boso sushi which imitates roses. They learned these three foods and cooked them actually. They enjoyed to chat while eating these own cooked delicious foods. We, seven countries and 42 people, made a trip to the Boso no Mura, the prefectural experience-based museum by bus on November 20th 2016. There were a rebuilt houses of merchants, Samurais, farmers and streets in Edo era. They enjoyed to touch them and experienced life styles in old days. They also enjoyed to wear armors and beautiful kimonos and perform a Japanese tea ceremony. There was the dram village next to the Boso no Mura where they could wear young girl’s kimonos and ninja wears and walked around in the village. It looked like the time slip to Edo era. They knew how to enjoy them very much. It was held at Keiyo Gas show room on September 24th 2016. We cooked and sold fifty foods, mocchiri and hot dumplings from Taiwan and China, popyato from Thailand and enbanada from South America immediately. There was the pleasant market outside though it was small. They sold folk craft articles of Peru, bags and accessories of Philippines and goods of Indonesia while speaking to the passersby pleasantly. Participants commented it was the great opportunity to communicate with people coming from the same country since it is rare to find them. If we know easy understandable Japanese when a disaster happens, it is easy to make communication with many foreigners using various languages. It suggests us to make wards and sentences simpler and more practical. If we utilize this method, we can communicate quickly with many people without translation in each language. We tripped to Yokohama area with 38 foreigners and 9 volunteers by bus though it was raining on November 15, 2015. It, however, cleared sky when we arrived at Sankei-en and enjoyed seeing the huge beautiful Japanese garden and historical architectures collected from Kyoto and Kamakura. We then went to China Town where the food festival was held and so crowded. After enjoying shopping and eating, we went to Yamashita Park. After enjoying bay circumstance, we were in the bus going back to Ichikawa while enjoying a bingo game and quiz of mathematics. It was held at regional disaster prevention bases which are 39 primary schools in the city on August 30, 2015. Many foreigners joined this drill in the Niihama and Kitakata Primary Schools. There were fire engines, an ambulance car, cop’s vehicles and special vehicles of SDF. They demonstrated how to evacuate in smoke, resuscitate using AED and others. They also experienced procedures in the evacuation shelters. The destination is Katori City, being called Koedo (Small Edo: old name of Tokyo). This area has prospered as water transportation system made by Tone River. We enjoyed Japanese summer festival I have seen first time, drawing the decorated floats, joining the folk dance and pounding mochi which was off season. We appreciate Katori International Association supporting us very much. We conducted "Knowing the World class" at Hirata Primary School. Ms. Tajima, originally coming from Taiwan, and Ms. Tanaka, from Philippines taught them with frequent Japanese about their home countries on June 3, 2015. Stephan from Sweden, Daniel from Spain and Sanbotan from Nepal spoke about their home countries next week at the same school in Japanese and English very enthusiastically. Three of them are learning Japanese now. School kids must be encouraged knowing the world. Mochitsuki Festival was held on Jan. 18th 2015 at Niihama Primary School with 100 participants. The enjoyed very much to eat since there were many kinds of toppings, such as Salsa from Mexico, powdered peanuts from Taiwan, fruits salads from Philippines, and chocolate banana from unidentified country. We also played Japanese cards as the second session. Hurry up and farer away to the higher place, Tsunami is attacking very fast. Be careful, , earthquakes hit again. They were running around and picking up cards and enjoying to get cards. It was raining from the morning on November 9, 2014. However it stopped when we left for Enoshima from the city hall. We learned the history, nature of Enoshima and public manners in the bus. We arrived there one hour or so and started to walk up to the viewing tower. There were many shops selling Manju (steamed bread), Youkan (sweet bean jerry), dried fish, sea weed and shell works along the road. After learning the way how to pray at the Ejima shrine, we went up to the viewing light house. We could see the mountains and sea half and half. We were enchanted by the beauty of nature. The bus was waiting for us at Kamakura since it would be crowded around Enoshima area. We took the Enoden railways which brought us to the parking lot in Kamakura. This train is unique since it is running almost hitting the roofs of houses slowly. We returned to the city hall just before 5pm. This CCEC’s annual cooking event was held at Ichikawa Kominkan on June 8, 2014. There were Thai Kaeng Khiao Wan which is cooked with hottest green curry paste and coconut milk, Mexican Tostadas which is covered by bean and tortilla, and Japanese Anmitsumame. Forty participants, Filipinos, Americans, Chinese, Taiwanese, Brazilian, Thai, Mexican and Japanese enjoyed cooking three kinds of foods. Those foods were so delicious and they ate many. 50 people, full seats of the bus, started for factories tour on Mar. 8, 2014. We arrived at Kikkoman Soy Source Factory in Noda where more than half of soy source in the world is produced. They enjoyed to see the process producing soy source. Then we moved to the Asahi Beer Factory in Moriya, Ibaragi. Most exciting time was ”tasting”. We enjoyed to drink the very fresh beer at the sky restaurant, 60m high, while viewing Mt. Tsukuba and Tokyo sky tree. Eating, Drinking and Studying. It was the very fruitful tour. More than 100 people gathered and pounded 7kg rice cakes by ourselves. We tasted them with the flavors of Taiwanese peanuts, Thai sprout, Mexican salsa sauce, Japanese sea weed and white radish. They were satisfied Japanese culture and traditional foods. After eating, they challenged the disaster prevention competition. The team won when they got the disaster prevention goods faster and more. They learned the important goods for the disaster prevention while enjoying. The winner got the beans which would be used for the traditional end of winter. Raise the seeds of international comprehensions. The open school of three classes of 4th grade at the Sugano Primary School. Three foreigners visited these classes and greeted in their own languages on Dec. 12, 2013. They explained many things about their countries and replied pupils’ questions seriously in broken Japanese. While they were taking lunch together talking about schools, foods and sports, they established the close relationship. The pupils feel they are international persons. We respect our cultures and customs and become the close friendship. It is our desire to raise such international exchange relationship. Bus Tour for Kawagoe, small Kyoto, on Nov. 24, 2013 coordinated by Cross Cultural Exchange Committee and Japanese Language School Committee. We enjoyed taking a walk on the old style streets chatting in their own languages and watching the souvenirs. We moved to Kita-in in the afternoon where beautiful fall foliage was. This temple has the close relationship with Tokugawa Shogunate. Some of the architecture was moved from Edo castle. We enjoyed to see the room where Iemitsu, the third Shogun, got born and the cosmetic set which Kasuga-no-Tsubone, the nursing mother of Iemitsu and even the toilet. After spending great fun time each other, they knew each other very closely and felt they were one close family. The Barbeque at 20th Century Forest ＆ Field in Matsudo City on Sep. 19, 2013. Many kinds of delicious foods such as chow mein, grilled chicken, grilled salmon, German sour clout and others were cooked under the clear blue sky. We ate so full, however we began to eat again since they were so delicious. After eating, it was relaxing time. Some of them were laid spread-eagle on the ground and others were playing soccer. We all enjoyed together regardless of nationalities and ages. At Tanabata, 2013, we enjoyed culture, country, foods and dance of Peru at Ichikawa Kouminkan. Silvia introduced Peru. There are 11 World Heritages including famous Machu Picchu. They speak Spanish and Quechua. The first immigration from Japan arrived at Port Callao in 1899. It was 10years earlier than the first immigration for Brazil. Gloria then showed Peruvian folk dance, wearing beautiful Peruvian cloth and singing Peruvian music. It was so rhythmical and enjoyable, so that many people joined into the dance accordingly. Lastly, they served tasteful Peruvian foods, such as Papa a la huancaina with cream cheese sauce and potatoes. By the way, did you know Peru was the country of origin of potato? We enjoyed the wind of Peru and many members would like to visit Peru after experiencing Peruvian culture this time. 45 friends in 15 countriers departed for the attractive destinations from City Hall at 9am on Feb. 17, 2013. This tour was coordinated by two committees(Cross Cultural Exch.Cmte. & Japanese Language Cmte. ), so that more than 100 members applied and the lottery was made. They returned to the bus on time though they acted on their own. All of them were satisfied and tired. 50 friends including more than 40 foreigners went toward the water fall in Yoro-valley, the most beautiful fall in Chiba, on Nov. 18, 2012. The attendees were over this time, so that another group followed by their own car. It was a little bit earlier for the fall foliage, however we enjoyed nice falls and some colored leaves in calm nature. We moved to the Otaki castle where was built by the famous samurai “Tadakatsu Honda” The meaning of this name is “only victory”. Unfortunately, this castle was rebuilt in 1970’s and made from concrete. However, we enjoyed to see the real Japanese swords, riffles and armors which the foreigners were so interested in. We could wear the armors and beautiful cloth actually. Please take a look at the beautiful princess and strong samurais. We welcomed the Sri Lanka friends on Jul. 14, 2012. They explained us the details of their country. Sri Lanka was colonized by UK in 1812 and decolonized in 1948. Its name was changed to Sri Lanka from Ceylon in 1972. It is very beautiful island called “Pearl in Indian ocean”. The size of the land is almost same as Hokkaido and the population is almost 20milliion. The special local products are tea, ivory, cinnamon and others. The coffee used to be a special local product. However all coffee trees died due to the disease. Then they changed to tea. You may know the familiar name “Ceylon Tea”. Three international male chefs gathered together at Ichikawa Public Hall and competed their fabulous cooking on Jun.24,2012. They were Mr.Kato from France, Mr.Melvin from Sri Lanka and Mr.Kinugawa from Japan. of family secret spices of Sri Lanka. The most famous Japanese food. More than 50 attendees including 20 foreigners were wondering around the foods with good smell and ate enough all three kinds of foods. More than forty participants left the City Hall by the Bus at 9am, Mar. 3, 2012,in good weather regardless of the cold rain weather yesterday. and already crowded at Nakamise-dori. They bought Japanese cookies, Kaminari okoshi, amazaki and picture cards. They bought their favorite souvenirs and returned to the bus on time. Of course, all of us have been Sensouji and prayed our good fortune saying ;Namukanzenon Bosatu. Then, we have been Hama Rikyuu surrounded by many tall buildings. Its park locates calmly in 400 year history using sea water for the ponds. We took a little bit gorgeous lunch here. actually happens. We experienced how to act when the disaster happens. New Year Party was held at Rose room in Bunkakaikan on Jan. 12, 2012 with gathering many people than expected. Mexican singer &quot;Alejandro&quot; played pomp-filled Latin musics. He played the guitar walking around the people singing the Mexican songs. Attendees were also getting enthusiatic with his play and began to sing and dance. Next, Salsa dance time. Papo-san and Yumi-san from Cuba trained us how to dance Salsa. We could dance (move) with the music after enthusiastic training. Last stage was Peru Dance which Gloria-san and her friends played beautifully. Time has pasted very quickly. copyright©2013 Ichikawa International Association (IIA) all rights reserved.